For new product design and development to be effective, one must understand both the big picture and the minute details of a project. Over the last 20 years, our customers have developed trusting relationships with Vallmar Engineering based on three vital elements considered throughout the product design process: quality, delivery and cost. To ensure quality, we carry out detailed electronic data creation and management of the project using the latest technology throughout the product design process. In addition, we are committed to continuing education and our team is constantly learning, asking questions and gaining knowledge through experience. We manage the steps of the product design process so we can keep our delivery promise. The planned delivery date is our bible. Whether a project includes reverse engineering or innovative ideas for a solution to a new problem, we keep project deadlines in mind at all times. Using advanced quality and delivery management systems typically provides the best cost. Vallmar Engineering uses the best technology available worldwide, and when combined with advanced quality and delivery management, decreased cost usually follows. Our team has been known to save up to 90% compared to existing quotes once we have reviewed a new product design and development project or looked to reverse engineer an existing product. By focusing on quality, delivery and cost throughout the product design process, the results are improved product design, faster production times and cost savings. 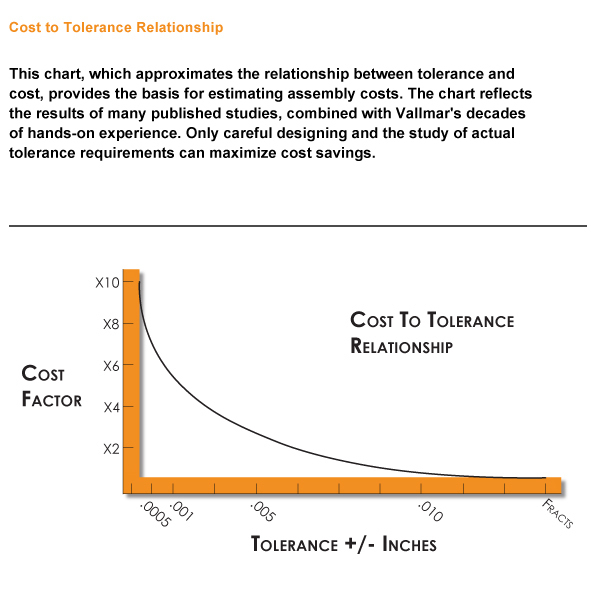 This chart, which approximates the relationship between tolerance and cost, provides the basis for estimating assembly costs. The chart reflects the results of many published studies, combined with Vallmar's decades of hands-on experience. 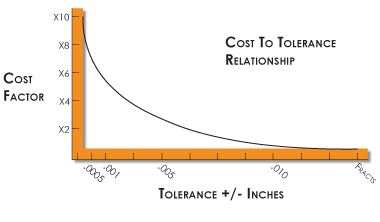 Only careful designing and the study of actual tolerance requirements can maximize cost savings.